In Totenart we have the full range of Paper Canson Infinity Photogloss Premium RC for digital printing. 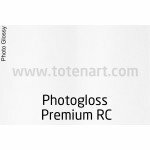 Infinity Photogloss Premium RC, 270 gr., A4, box 25 sh. Infinity Photogloss Premium RC, 270 gr., Roll 0,432x30 mts. Infinity Photogloss Premium RC, 270 gr., A3, box 25 sh. Infinity Photogloss Premium RC, 270 gr., A3+, box 25 sh. Infinity Photogloss Premium RC, 270 gr., A2, box 25 sh. Infinity Photogloss Premium RC, 270 gr., Roll 0,61x30 mts. Infinity Photogloss Premium RC, 270 gr., Roll 0,914x30 mts. Infinity Photogloss Premium RC, 270 gr., Roll 1,118x30 mts. Infinity Photogloss Premium RC, 270 gr., Roll 1,524x30 mts.